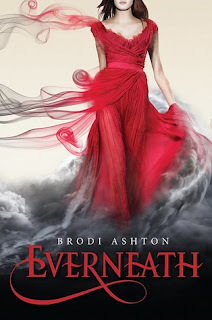 Author Brodi Ashton brings a breath of fresh air into the paranormal romance young adult genre. Nikki has decided to become a Forfeit, someone who allows an Everliving to feed off of him/her. When Nikki is finally allowed to stop the Feed, a century later, she chooses to go back to her life for six months rather than go with Cole, the Everliving who appears to have suddenly developed a heart. Cole is not happy with this arrangement, he follows her and causes plenty of trouble along the way. Nikki's ability to stay youthful and retain her memory after being fed off of by an Everliving are subject to speculation, could Nikki challenge the Everlivings' current Queen? Who is the boy whose face and memory anchored Nikki while she was being fed on? Can Nikki leave with a proper good-bye this time? These questions are, at least partially, answered in this phenomenal book. Nikki's character was intriguing. She can be impulsive and dramatic, but she can also be exceedingly patient, intelligent, and caring. The reader will connect to Nikki quickly. The secondary characters, particularly the two male love interests, will capture and hold the readers' attention as well. This book is a great read and just in time for Christmas. Everneath is perfect for teen/young adult readers or the young at heart. Awesome! This sounds great I can't wait to start it.